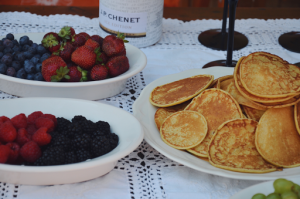 Pancakes are one of my favorite things to make and eat so I already took time years ago to research all the tips and tricks on making those perfect fluffy golden brown pancakes. First rule: the secret is not in the recipe but in the way of making them – I don’t even use any kind of recipe to make them, I already made them so many times I know the ingredients by heart and while you combine that with a little feeling and those 10 rules I’m about to tell you, you’ll get it right no matter which recipe you’ll use. Use high quality ingredients – good butter, homemade eggs, full fat milk (or a vegan substitute). The better the ingredients, the better the pancakes. Always mix wet ingredients first and then add the dry ones. In my case – I whip 2 eggs, add milk, melted butter and in a different bowl I mix flour, a pinch of baking powder and pa pinch of salt. It is best to add dry ingredients to the wet ones using strainer, since that’s how you avoid lumps and you get a nice smooth batter. 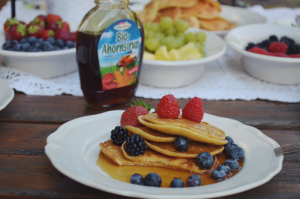 We combine ingredients and mix them very lightly and quickly – in a way that we incorporate the most air into the batter and making it ‘bubbly’ – that’s what makes the pancakes fluffy. We let the batter sit on cold for at least 5-10 minutes. We can also make the batter in advance, cover it and put it in the fridge and use it in an hour or two. When we take it out we don’t mix it again. Use the thickest pan. The older the better. Butter. Not vegetable oil, but butter. 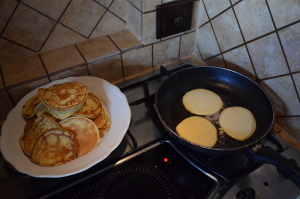 It makes pancakes better, more buttery and nicely golden brown. We put it on the pan approximately a minute before pouring the first round of batter so it starts bubbling. We don’t need to add additional butter for every round of batter, cause the pan stays greasy enough. The first pancake might even be a bit too much greasy but every next is going to be optimal. Use medium to low heat. And make sure you heat the pan prior adding the butter and starting to bake (it takes about 3-4minutes). If you use a heat too high, you’re going to burn the butter and it’s not going to taste good. Don’t EVER press the pancakes with your spatula – it’s not going to make them cook any sooner it’s just going to ruin the fluffiness. Choose your favorite topping. 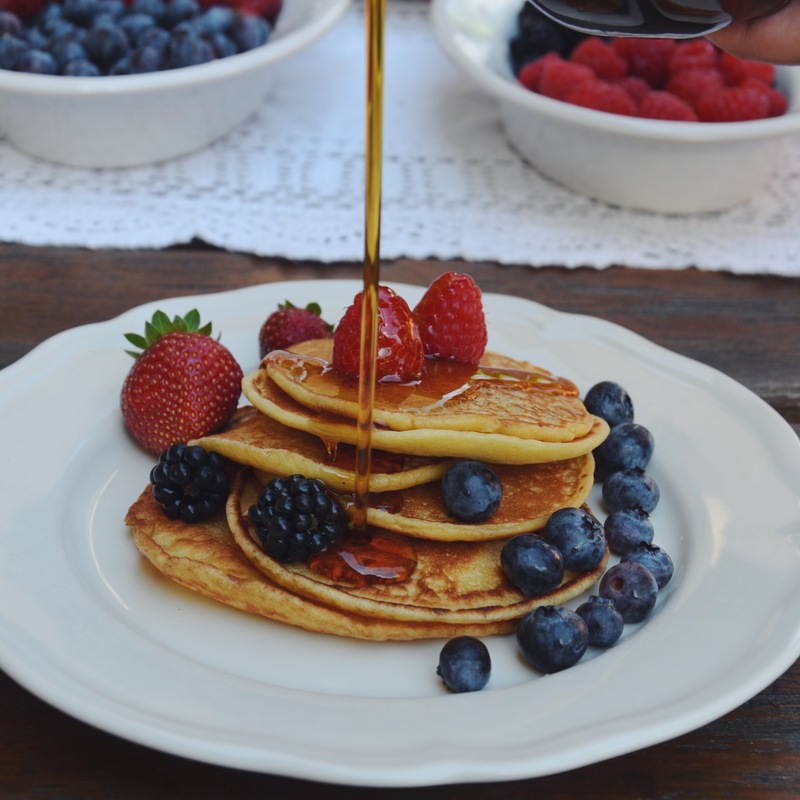 I use berries and maple syrup, but the options are limitless.